P2P - What is Peer-to-Peer network ? In Peer to Peer (or P2P) network each of the participation workstation (computer) has same (equivalent) privileges, capabilities and responsibilities. This type of network architecture is completely different from client/server architectures. In Client Server Architectures, some computers store information and have access to resources, which other computers in network can access through them. These computers or machines with extra privileges are called Servers and dedicatedly “serve” clients. 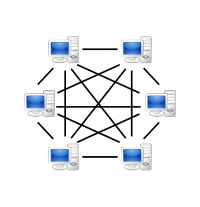 In Peer-to-peer (P2P) networking the need for central servers is eliminated, and all computers interact and share resources as equals. Thus it can be said P2P architecture is the alternative to server-client network design. Each communication node has both server and client capabilities. This peer-2-peer application structure was first popularized by file sharing systems like Napster. P2P is especially popular in homes where an expensive, dedicated server computer is neither necessary nor practical. Peer-to-peer networks are generally simpler, but their performance usually decreases when there is heavy load. This type of file transfer system is decentralized and allows a user to search through all the linked computers for desired file. To use P2P, a user should download P2P software on his machine and configure it.Torrents use this technology effectively. What are Client Server Networks? P2P - What is Peer-to-Peer sharing ?